Tonight was the first run of the season. For me in any case. I had done this run last year as well and nearly had to be pushed to the finish by my friend. So, this year's goal was: beat last year's time! I started jogging as soon as we crossed the starting line. Of course I couldn't keep that up, but still, the first few seconds had been won. I jogged again a bit later and immediately noticed a problem. I need a knee brace and the one I have now is too small (it was the largest they had) and came apart at the seams. No knee brace means problems in my calf. That was it for the jogging. Or was it? Because I tried again a bit later going downhill and it didn't bother me that much. From then on we jogged as much as we could when going downhill. 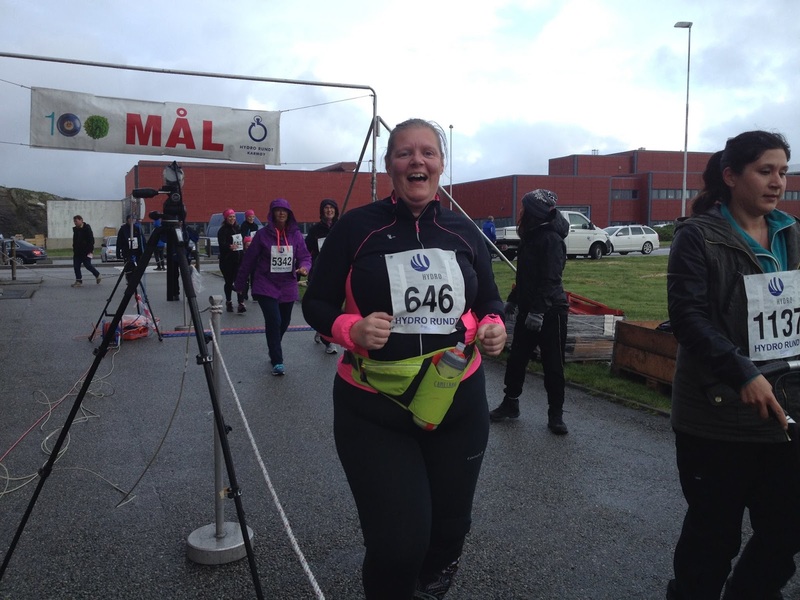 During the fourth kilometer it started to rain. Not heavily, but enough to get wet. I had to take my glasses off to be able to see anything. In the fifth kilometer my friend left me. She wanted to take a photo of me crossing the finish line. I kept going on my own, which was a lot harder than with my friend who will spur me on each time. But finally there was the finish line! The big question of course is: did I beat last year's time? Well, you will have to come back tomorrow... just kidding. I did. I beat last year's time. By about 9 minutes I reckon and I am chuffed to bits. Now I just need a better knee brace! In other news: I have decided not to participate in the triathlon. At least not the one in June. I am a fair weather athlete (using that term very loosely here) and I don't like gyms and such, so my training so far has been mainly jogging in the last few weeks. My friend and I will continue doing that twice a week, but that is not enough for a triathlon. I also need to swim and cycle. There is bound to be another triathlon sometime in August/September, which would suit me much better, because I do want to beat last year's time there as well! Good decision to know your own body and how to make it work for you. Mooie ervaring, vanavond, topper! En: goede beslissing wat de triatlon betreft. Tijdens een volgende triatlon ga je dan zeker weer een pr scoren! You go, girl! 1st - HOORRRRAAAHHHHH.... well done Mara!!! 2nd - good to rethink the timing of the triathlon. 3rd - not sure what 'brace' you have used, but for exercise, you may be better to use athletic strapping (like footballers), or a simple elastic support bandage which is able to move with you whilst stabilising the area... your pharmacist ought to be able to help with this. Keep up the good training Mara....you are inspiration to all who want do but don't!! You just got out there an did it!! I understand why you want to wait for the triathlon. I am always impressed with people who run, I just don't like it!